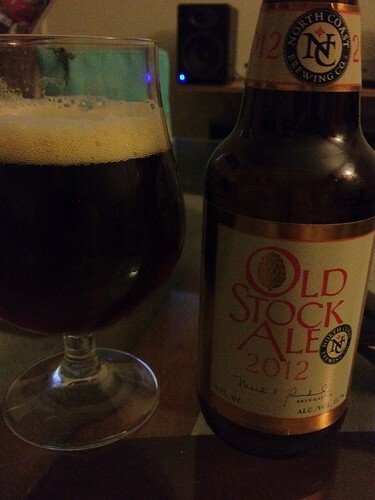 North Coast Old Stock Ale 2012, originally uploaded by adambarhan. A: Pours a dark caramel/toffee with a thin light cream-colored head. Almost entirely opaque with some carbonation. S: Smells of toffee and caramel. Rich malt base. Still fairly hot in terms of alcohol. T: Definitely still fairly hot. This is my first of these, and even with a year on it you can definitely taste the 12.5 abv. M: Medium to full body with a smooth creaminess. Definitely large alcohol notes; this is still quite hot, although still good. This is a beer that could definitely use quite a bit of time more in the cellar. D: Again, still a little hot. Still, quite nice. I’m hoping that some time in the cellar will help the complexities in this one come out a little bit more.